Lockhart Cattle Company creates a unique product in Jackson. The Ranch has created a closed ecosystem; their beef is born, raised, butchered and consumed in Jackson. Grassfed cows take almost twice as long to raise as the conventional grain fed counterparts. Calves born at Lockhart Cattle Company aren’t ready to eat until they are between 24 and 30 months old. “97 percent of cows in this country get sent to feed lots in places like Iowa and Nebraska to fatten up quickly, our cows stay in Jackson, eat only grass, and then go strait to local butchers like Justin at the Whole Grocer,” said Lockhart. At Lockhart Cattle Company calves are born in the spring and spend their first summer nursing from their mothers until fall when calves start eating grass. Lockhart Cattle does things differently after calves are weaned by keeping yearlings on the ranch until harvest instead of trucking them off to a feedlot. Lockhart yearling calves spend over two years on the ranch gaining weight by eating nothing but grass. When the animals are large enough to slaughter that process starts at Hog Island Meats a few miles south of Jackson. Hog Island Meats slaughters and dry ages Lockhart beef for 21 days before quartered animals are delivered to local butchers. 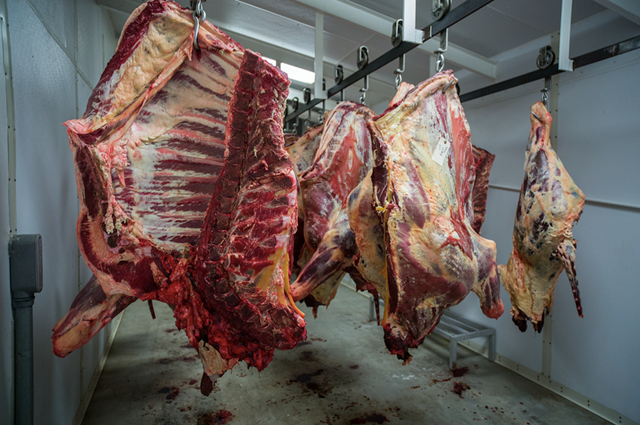 “Our customers are looking for a healthier and more environmentally sustainable alternative to the factory farm and feedlot beef,” says Justin Shepler, the Meat and Seafood Manager at the Jackson Whole Grocer. “In our current food system it is very rare to sell a food product that has never been further than 8 miles from the store,” Shepler added. Lockhart beef satisfies a demand in Jackson for local, healthy, and sustainable products. The Cattle Company produces high-quality lean meat while preserving open space and wildlife habitat. Lockhart Cattle Company beef is sold at local restaurants and specialty markets like the Aspens market, Pearl Street Market, LDS Market, the Local Butcher, and the Jackson Whole Grocer.